Includes the names: Mike Huckabee, Gov. Thursday, February 5 at 11AM Former Governor of Arkansas Mike Huckabee signing his new book, God, Guns, Grits, and Gravy Books for our event with Mike Huckabee are available in-store ONLY. We are not currently processing online orders for this title. We will resume processing online orders for God, Guns, Grits and Gravy after the event. If you'd like to attend the event and have a book signed, you must purchase it in-store. Join us this morning when former Arkansas Governor Mike Huckabee signs his new book, an exploration of today’s fractious American culture. This event is a SIGNING only. Tickets are required to join the signing line and only available with the purchase of a copy of God, Guns, Grits, and Gravy from BookPeople. Please see below for event and ticket details. EVENT GUIDELINES: This event is a SIGNING only. Tickets are required to join the signing line. Tickets are only available with the purchase of a copy of God, Guns, Grits, and Gravy from BookPeople. Books & tickets are now available to pre-order. Purchasing a book online automatically assigns you a ticket for the signing. There is no separate "ticket" item to add to your cart. The line for the signing will form first come, first served the day of the event. Additional guidelines to come! ABOUT Mike Huckabee Mike Huckabee is the former governor of Arkansas, 2008 presidential candidate, and the host of the #1 weekend show Huckabee on Fox News. He is the author of eleven previous books, including New York Times bestsellers A Simple Christmas and Do the Right Thing. He and his wife, Janet, live in Florida and still spend time in Arkansas. They have three grown children and four grandchildren. ABOUT GODS, GUNS, GRITS, AND GRAVY In God, Guns, Grits and Gravy, Mike Huckabee asks, “Have I been taken to a different planet than the one on which I grew up?” The New York Times bestselling author explores today’s fractious American culture, where divisions of class, race, politics, religion, gender, age, and other fault lines make polite conversation dicey. Stories of everyday Americans surviving tough times, reflections on our way of life as it once was, as it is, and as it might become…these subjects and many more are covered with Mike Huckabee’s signature wit, insight, and honesty. Can't make it to the event? You can order a signed copy! Add the book to your cart and write "SIGNED COPY" in the comments field during checkout. We ship worldwide. Thank you for supporting your local independent bookstore! Mike Huckabee is currently considered a "single author." If one or more works are by a distinct, homonymous authors, go ahead and split the author. 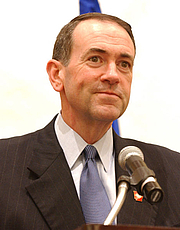 Mike Huckabee is composed of 2 names. You can examine and separate out names.